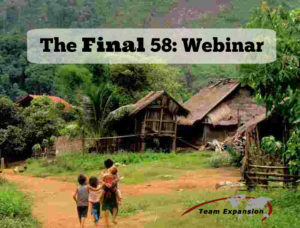 Catch the latest webinar on the Final 58. Did you know that there are only 58 unengaged, unreached people groups in Laos? On the latest webinar we discussed how plans are in motion to reach these last people groups in the country of Laos, a country in southeast Asia. A team is currently surveying throughout Laos to confirm the name and location of each people group. (The team recently discovered two groups that have never been named on any list before.) When the survey is complete, teams of Lao missionaries will be sent to begin making disciples and planting churches. Listen to one of the researchers directly from Laos to hear up-to-the minute reports on how the research is progressing. Caleb Bislow, author of Dangerous, also joined in to offer his dedication and heart to reaching the unreached. You’ll also hear an update from the Vision Laos Conference that took place in February. How can you be involved? We’ll answer that and more during the webinar! “Disciple Multiplication You Can Use” took place on July 20, 2016. It featured Dr. David Garrison, author of Church Planting Movements, and Doug Lucas, President of Team Expansion discussing disciple making movement principles and practices. The second webinar in this series features Bryan King, the Campus Minister for the Sapulpa campus of Cedar Ridge Christian Church in Broken Arrow, OK discussing disciple making movement principles and skills with Doug Lucas, President of Team Expansion. Troy Cooper helps churches and groups maximize their impact on the world. Using simple drawings and teachings at our most recent webinar, he shared ideas about how to multiply more effectively, grow more efficiently, and love God with all our hearts. View a pdf of the slide presentation or see the notes. View a pdf of the slide presentation or see the notes .